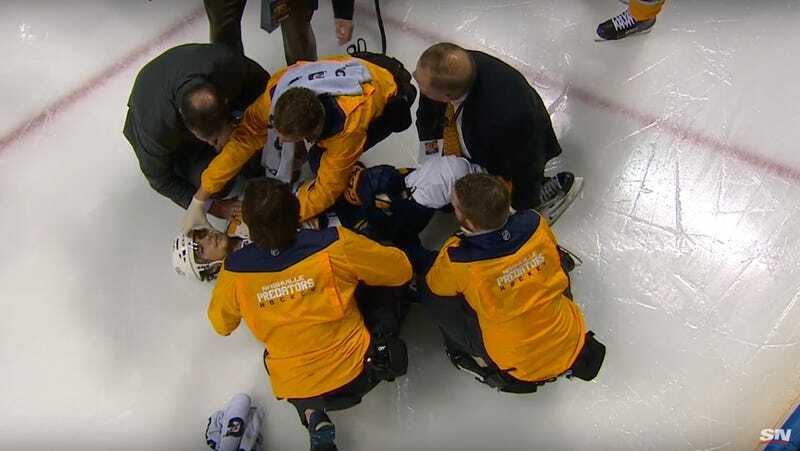 During the first period of Game 1 of the Predators’ playoff series with the Blues, Nashville winger Kevin Fiala got squished into the boards by Blues defenseman Robert Bortuzzo. The crash was very ugly and Fiala folded up like an accordion after he hit the wall. Getting scrunched down to the ice by Bortuzzo probably didn’t help much. After a few minutes of evaluation by trainers, Fiala was carted off the ice. Fiala, 20, is playing in his first NHL playoffs, and he scored an OT winner against Chicago last week. The team announced that he had been taken to a hospital and was in stable condition. Update, 1:04 p.m. EDT: Fiala has a broken femur and will miss the rest of the playoffs. Fiala is resting comfortably at Barnes-Jewish Hospital in St. Louis, Predators general manager David Poile said Thursday.